New Leaf offers education, training and employment to adults aged 16+ by creating educational gardens. We are based at West Dulwich railway station where we have our shop and our New Leaf Botanical garden. New Leaf’s founder – botanist and plant historian – Vinnie acts as a mentor to the people we train. New Leaf has helped people start careers as gardeners, tree surgeons, construction workers and more. We have just launched a programme of accredited courses through the exam board AQA, and hope to expand into the delivery of BTEC and Level 2 Horticulture courses. New Leaf is already a hub for people in Dulwich, with friends dropping by at all times to chat, to do their shift in the book shop, and to drop-off unwanted books for us. Local people of all ages come and learn about the plant and insect life on our doorstep, and we would like to run more regular gardening workshops for locals and children. We are often featured in local newspapers, and New Leaf has won the Our Heroes’ Award, Community Project of the Year, and has earned the South London Press/Shell UK Awards three years running (2010, 2011, 2012). 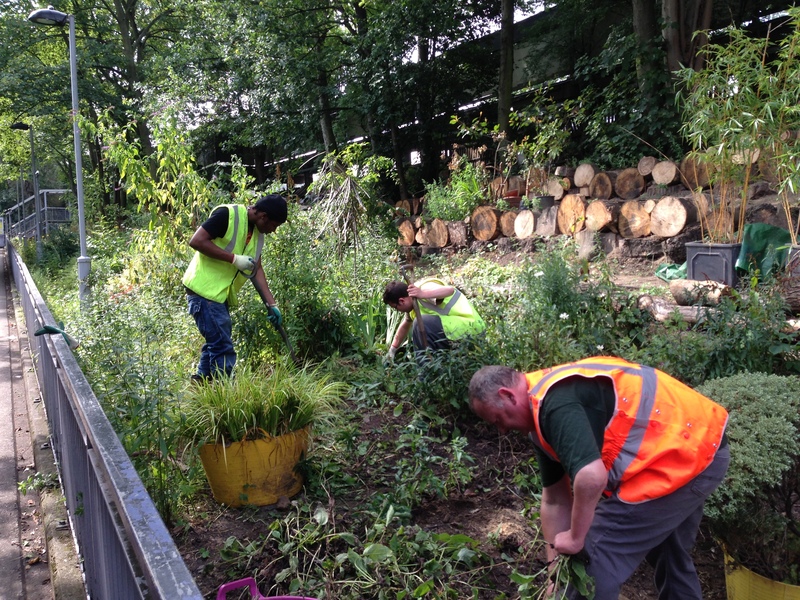 We also go out into the community doing outreach work, and have created several gardens across London. For the latest developments of our project, click through to our Facebook page here.